The City of Goshen is preparing for the dangerously low temperatures expected to be reached later this week. The following information may be of use for residents as they prepare their homes and neighborhoods for the situation. As information is available it will be released to local media, but for quickest access to updates residents may refer to the City’s web page at goshenindiana.org or go to City of Goshen on Facebook at facebook.com/CityofGoshen. 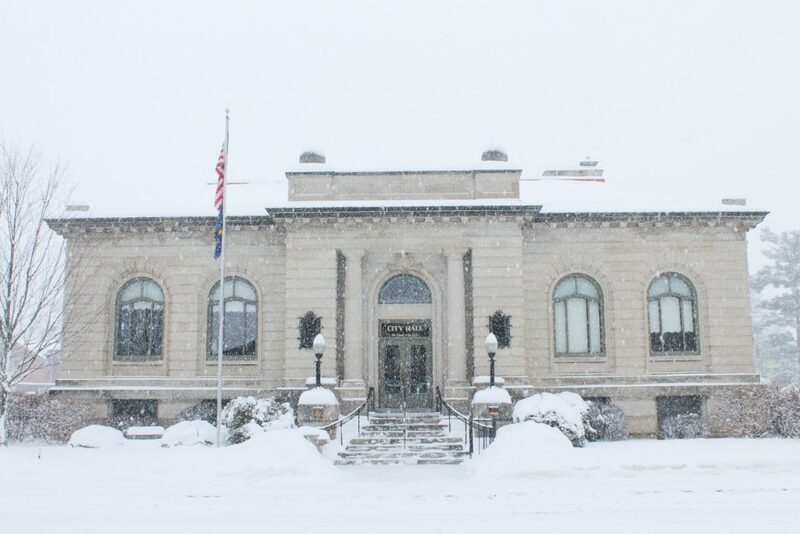 City offices will be closed Wednesday and Thursday, with only essential staff working. All City Boards and Commission meetings are canceled for the rest of the week. In Elkhart County, wind gusts are expected to reach 35 mph, with wind chills as low as 45 degrees below zero, from Tuesday evening through Thursday afternoon. Snow is to accumulate more each day. Per US Occupational Safety and Health Administration (OSHA) standards, non-emergency outdoor work should cease when temperatures reach 25 degrees below zero in situations where wind reaches 20 mph. Click here for more information from OSHA. Additionally, the National Weather Service reports that travel could be very difficult. Considerable blowing snow could significantly reduce visibility. The hazardous conditions could affect the morning or evening commutes. The dangerously cold wind chills could cause frostbite on exposed skin in as little as 10 minutes. STREETS: The Goshen Street Department will proceed with their established procedures unless the snow and high wind behaves in unusual ways. City streets are being plowed in order of priority by traffic volume. PARKING: Wherever possible cars and trucks should not be parked on streets or in alleys. Vehicles should be parked in garages and drives, not in yards. This allows crews to clear their routes more completely and more quickly. DRIVING: Slow down! Roads may have snow pack, even after plowing. Major streets are sanded and salted more liberally than neighborhood and side streets. Mid-blocks on these streets get less sand/salt than intersections and their approaches. Beware: You can be ticketed for driving too fast for conditions, even if you’re not exceeding the posted limit. When driving, keep your head lights on. During snowfall and drifting snow, plow drivers have low visibility, especially for white vehicles. Be sure your vehicle is ready by checking that windshield wipers are performing their best; if not, replace them. Brush snow off windows— driving by looking through tiny cleaned spaces is dangerous. For vehicles with rear wheel drive, add weight to the trunk, (use sand, kitty litter, etc.) and store a shovel in the trunk in case you slide off the road or can help others in this situation. The Interurban Trolley will offer free fares on all fixed-route trolleys Tuesday, Wednesday and Thursday. Users are able to view real-time updates of Trolley locations by visiting ride.interurbantrolley.com, downloading the Ride Systems app, or by the Ride System text messaging service. Check for estimated arrival times and updates in case of any delays. SIDEWALKS: Goshen does not have an ordinance requiring property owners to clean their sidewalks, but encourages them to do so voluntarily. That being said, temperatures will dip to dangerously low levels. Property owners are asked to be mindful of the weather and not to over exert themselves when outside. Those clearing sidewalks should take as many breaks as needed, stay hydrated and seek shelter if they feel too uncomfortable in the cold. The Parks & Recreation Department will be cleaning trails, giving priority to routes to schools, but they may take longer to complete their tasks due to the weather. WATER LINES: The Goshen Water Utility has determined that a Freeze Warning is unnecessary at this time. However, customers who have water lines prone to freezing are encouraged to leave their water run in a small stream the size of a pencil lead, at a single cold-water faucet, located inside their home or business—running water is less likely to freeze. Open kitchen and bathroom cabinet doors to allow warmer air to circulate around the plumbing. A faucet that won’t yield water is the first sign of frozen pipes. Customers who experience loss of water service, or a slower than normal water flow due to a frozen water line, are asked to contact the Water Utility at 534.5306. The same number may be used to report a burst line. TRASH COLLECTION: Borden Waste-Away, Goshen’s contracted trash removal company, will not run on Wednesday. As of Monday afternoon, the plan is to delay pickup by one day through the rest of the week. Normal schedules will resume Monday, Feb. 4. That may change if Borden cannot run Thursday. Look for updates at goshenindiana.org or the City Facebook page. TAKING CARE OF OTHERS: Residents are asked to look after their loved ones and neighbors, particularly the elderly. If you know of anyone in need of a shelter during the day or overnight, contact The Window at 533.9680 or Goshen Interfaith Hospitality Network at 534.2300, respectively. Get pets inside to a warm area. If you are cold at any given time, your pet will be too. This applies to rabbits, horses, ponies, dogs, cats, etc.